(Samuel) Theodore Mander's (1853-1900) lasting memorial today is the House Beautiful he built. 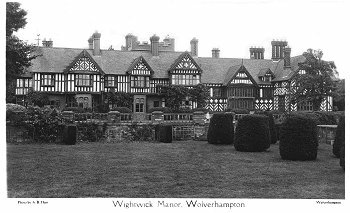 He bought the Wightwick Manor estate, thee miles from the centre of his business and public interests in Wolverhampton, in 1887. Immediately he set about planning and building a new house on the site. It was the beginning of an inspired project of artistic patronage which would last for six years. Today the house, with its remarkable furnishings and associated collections, is reckoned as one of the most complete and representative examples of late nineteenth-century taste. As Mark Girouard writes, the Manders were part of "a large body of cultivated upper middle-class families who read their Ruskin and Morris and expressed their artistic tastes in their houses." Wolverhampton was one of many lively, growing manufacturing towns where an educated middle class was beginning to take a keen interest in the arts. The young Philip Webb, William Morris's own architect, had trained there, before becoming assistant to G.E. Street in 1852. Compton Hall, a stone's throw from Wightwick, was home of Laurence Hodson, a Midlands brewer. 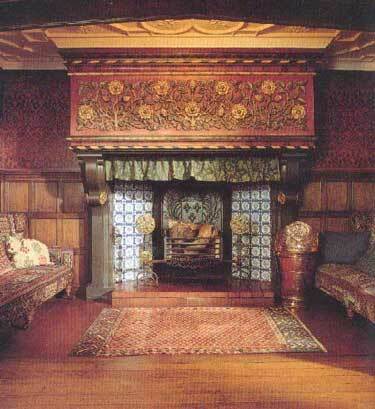 It was decorated by William Morris & Co. and gave its name to one of "the Firm's" best-known wallpapers of 1896. Edward Burne-Jones himself married Georgiana, companion and soulmate of Morris, and one of the three beautiful and talented daughters of the local Methodist minister, George Browne Macdonald. 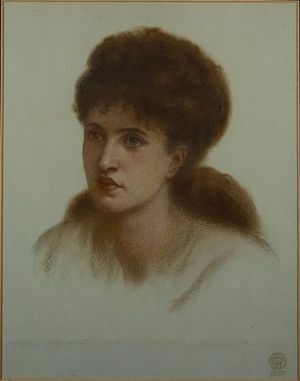 Her sister, Agnes, married the artist Sir Edward Poynter, and she was the aunt of both Rudyard Kipling and the prime minister Stanley Baldwin (another Midlander, related by marriage to the Manders). At Wightwick, Theodore soon had a context where he could exhibit his progressive aesthetic ideals in complement to the successful business at Mander Brothers. 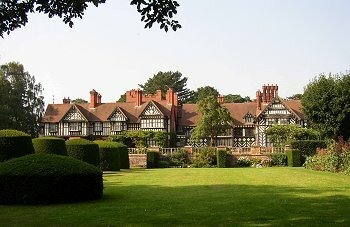 First he put into repair the Tudor 'old manor' and then he commissioned the Liverpool architect, Edward Ould, as the result of a limited architectural competition, to build a new house on the site adjoining, which they called Wightwick Manor. Edward Augustus Lyle Ould (1852-1909) had studied in York in the early 1870s and became a pupil of John Douglas (1829-1911) of Chester, the most successful of the Chester architects who had followed Thomas Mainwaring Penson (1818-64) and James Harrison. Their historicist revival of half-timbered architecture was based on the study of all the fine Tudor timbered vernacular buildings exemplified by Speke Hall and Little Moreton Hall in Cheshire and Lancashire, and Ockwells in Berkshire. Douglas had a practice producing country houses and their dependencies, including work for the Duke of Westminster (a founder of the National Trust in 1894) such as the Flemish Gateway at Eaton Hall of 1882, and churches all over the North West, into Wales and the Midlands. Ould followed this pattern and set up in practice in 1882, still working for the Duke of Westminster, and after 1886 with the older George Enoch Grayson (1834-1912) in Liverpool and Chester; mainly building villas, smaller houses, rectories. Their better known work included additions to the model Utopian village of Port Sunlight (1888-1914) on Merseyside for the philanthropic soap manufacturer, William Hesketh Lever, with housing, cottagy schools, a social club, an inn, and a post office and shops. They built Uffington House at Dee Hills, outside Chester, for Judge Thomas Hughes, author of Tom Brown's Schooldays. Architects like George Devey and Philip Webb, and Norman Shaw and W. Eden Nesfield (acting in partnership in the 1860s), had successfully established their Old English revival by the 1870s as a pervasive orthodoxy; a mood and approach, national and cultivated, as much as a style. Edward Ould's deliberate and strict historicism offers the pun which describes his work at Wightwick: 'Ould English'. It looks back, particularly in the 1893 wing, to the Ruskinian aesthetic of the Gothic Revival, so instinctive at Wightwick: organic planning, structural truth, exemplary craftsmanship, sound building, 'fitness for purpose'. And the encyclopaedia of features is precisely what the Ruskinian language demanded: the nuanced accent, Webb's "sign manual of instinct and imagination", Ruskin's "architecture, dependent on the warmth of the true life: workmanship". Ould's approach was more eclectic. He was less interested in Ruskin's universal French gothic, than the charm of organic growth in the old Bavarian towns, say, with their "medieval streets, the quaint simplicity, the glowing colour laid on by time". His careful analysis of the half-timbered vernacular culminated with the publication in 1904 of the study on which he collaborated with James W. Parkinson: Old Cottages, Farm-Houses and other Half-Timber Buildings in Shropshire, Herefordshire and Cheshire. Ould's half-timber vernacular is a provincial, accented variant, with the limitations, robustness and specialized knowledge implied; more scholarly, but also more felt and rooted. He was interested in the 'constructive details', using load-bearing beams, posts and trusses. This of course looks forward to Lethaby's emphasis on rational function, truth and efficiency; his insistence that even Gothic was basically an engineering solution to mechanical problems. But at Wightwick the core is self evidently brick, and the timber decoration does not accord with Arts and Crafts principles of 'truth to materials'. It is a surface treatment, visually convincing, but a structural sham, an overlay of evocative decoration, an imitation of style but not intention. Improvements at Wightwick. When he went there the house was surrounded by a scattered village of unhealthy and miserable cottages, but Mr Mander soon brought about a great change, a considerable sum being expended by him in practically re-modelling the whole village. The old decayed buildings were removed, and new and picturesque cottages, with pretty gardens, took their place, while even the village inn -- the well-known Mermaid -- was revolutionised. He had the building, both exterior and interior, to a large extent reconstructed; attached to it a reading room and village institute; and re-opened it as a temperance public house on the lines laid down by the bishop of Chester. The sale of intoxicants was not prohibited, but limited in quantity; and here the wayfarer of visitor might obtain such other refreshments -- in the shape of tea and coffee, and a well-cooked chop or steak -- as they might desire. Wightwick was built in two distinct phases. Substantially Phase I of 1887-8 was relatively modest, still the suburban villa in scale, in the Shaw-Nesfield tradition, but with exquisite craftsmanship and detailing. These were further developed in a remoter key in the Phase II additions of 1893. 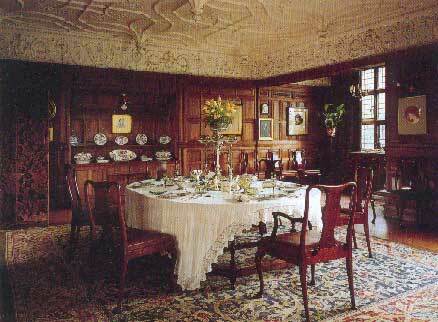 Then the Great Parlour/Dining Room/Billiard Room wing was added to the east, as large again as the original house, and grander, richer, more delicate and lyrical, establishing Wightwick as a triumph of the aesthetic house. The exterior is sixteenth century, a riot of carefully-crafted half timbering, jettied stories with rhythmic chimney stacks, in contorted barley-twists or capped with over-sailing courses; contrasting textures in unyielding Ruabon brick, tile hanging of Madeley tiles, or local red sandstone with Tudor windows; a roofscape of gables with deep fretted barge boards and Perpendicular crocketed finials, or hipped roofs and dormers; a synopsis of vernacular detailing which is, at first sight at least, convincing because faithful. At worst it leads to baroque hyperbole, more mechanical than the originals, the timber theme exhausting itself in every variation; cusps in trefoils and quatrefoils, and skeletal herringbones and wishbones, ogival curves and panels, diapers, little oriels and bays, coved and jettied overhangs. The cranked Jubilee porch (1887) of welcome proclaims homeliness and ease, carved with nocturnal owl and bat. A conceit allows the house to develop, visually and in its planning, from a pele tower kernel, with its battlements suggesting to the outside world that the house has evolved by a slow process of organic accretion from feudal times. The 1893 east wing is the apotheosis of the half-timber style, without the bright red brick; oak craftsmanship 'touched with emotion', all the timber 'cut from the solid', articulated with mouldings, corbels, splices, dowelled joints; chiselled, turned, carved, fretted’--all set on a 'Straits' sandstone plinth course. It has acquired creepers and weathered to an ashen grey, confirming Ould's preference of half-timbering because "no style of building will harmonize so quickly and so completely with its surroundings and so soon pass through the crude and brand-new period". Pevsner describes it as "eminently picturesque, but conventional"; for this is the picturesque without frivolity, an earnest nineteenth-century taxonomy of timber styles and features, reverently executed. If the outside is 'conventional', it is the interior which continues to delight and instruct, with its teasing accumulation of detail, its didactic show of contrasts. Janus turns a different face to the household gods. Ruskin reminds his disciples: "Our God is a household god, as well as a heavenly one; He has an altar in every man's dwelling". The interior is rich and more evolved, distanced from folk vernacular. The mood is later, more patrician, the context austerely late Jacobean, and everything is delightfully textured; oak enhanced with telling blazons of colour, busy and frenetic, where light plays on, penetrates, textures of wood and wool, tile, plaster and stained glass, establishing a late Victorian aestheticism of gloomy tranquillity. There are subtleties of planning which can seem to us quirky and tiresome; rooms disposed at angles to one another, so you must cross passages by what the family describe as a succession of knights' moves, with sudden shifts of view. sparkling fires, radiant inglenooks, cheerful company, good fare, merry children, bright flowers, open windows and vistas of well polished furniture, mirrors, delft plates and rows of shining pewter dishes, jugs, tankards and braziers to make it seem joyous. Delightfully quaint panelling on the walls, relieved with little cunning recessed cupboards encrusted with the spreading wrought iron hinges and latches... On the shelf terminating the panelling was a rare collection of old bits of china, glass, pewter, and copperwork, and lovely old German heraldic glass had been worked up with the roundels of the leaded casements... Up in the roof was his own sanctum and studio, a little woodlined ark, the purlins of which formed shelves for further treasures. Nothing but genuine old furniture was here, and from this eyrie he looked upon the purple roofs and blue skies. Wightwick is a frame for the client's connoisseurship, here contrived by the man of taste who had "read his Ruskin", to be "rich of human pleasantness", in its Ruskinian "colour, texture, ornament, delight"; suggesting a slow accumulation of possessions and interests, washed by the passing waves of humanity, a setting for the moral family life, lived on pious Christian principles, and the temple of the muses. The house here has successfully evolved in this direction, as a living, evolving museum of nineteenth-century art and architecture. With its elaborate interiors of William Morris furnishings -- tiles and lustreware pottery by William de Morgan (potter and novelist), plaster ceilings and friezes by Leonard A. Shuffrey, and stained glass and painted plaster reliefs by Charles Eamer Kempe (1837-1907) -- it is often said to be the ideal of the William Morris interior, and a period piece. 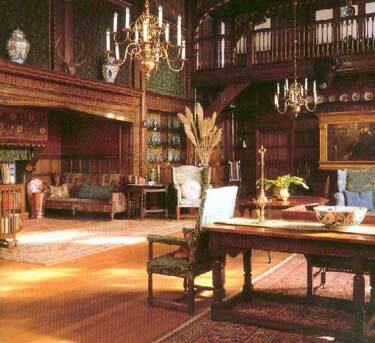 Neither is true, of course, in the sense that the complex of influences ranges way beyond Morris, and he never advised or came near Wightwick -- here the owner was always the animating spirit and ensemblier -- and the furnishings and collections have been systematically augmented since Theodore's death, with increasing quality and correctness. But the result is a happy example of what Morris described as "the most important production of Art and the thing most to be longed for ...[The House] Beautiful." The retrospective creation we have forms a convincing illusion of the Morris style, which, as Rosalie Mander never tired of reminding visitors, both as a style and commercial venture was dependent on the successful manipulation and interpretation of the ideas of others. It is the integrated house beautiful, expressing the ideals of an entrepreneurial class committed to moral, social and aesthetic improvement rather than organized display. 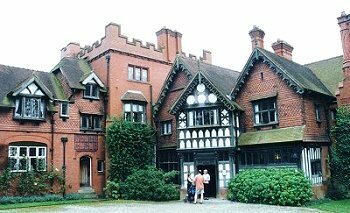 At many points Wightwick's interior scheme, with its romanticism, its surface articulation and historical references, departs from the anti-aesthetic austerity of the later Arts and Crafts. It reflects a personal and developed variant of artistic taste that related to a grander, more literary style; in sympathy, for instance, with the superadded sensualism of Swinburne and Rossetti. This is partly because it has not stood still, of course, and Wightwick illustrates the whole gamut of late Victorian design. From the beginning much was supplied by Morris & Co., but much has been added, improved or renewed, illustrating all aspects of "The Firm's" interests. It now contains some 400 items of Morris work; the Morris and de Morgan collections are "perhaps among the largest in existence". Morris wallpapers include 'Pimpernel', 'Tulip and Rose', 'Peacock and Dragon', 'Bird and Vine'. There is embroidery, silk and wool textiles -- including many of the woven woollens -- hand-knotted carpets, and books of the Kelmscott Press. Kempe often visited the house, dressing for dinner in Elizabethan costume, and is said to be responsible for the medievalizing polychrome decoration in the Great Parlour, recalling Hardwick Hall. There are also two panels of the Seasons brought in 1937 from his own house at Lindfield, Sussex, with characteristic saffron colouring, signed with his wheatsheaf badge. Today the leading names are all here: there are light fittings and metalwork by William A.S. Benson (including candelabra designed for Holman Hunt) and also in the Great Parlour by George Jack (1855-1932), Philip Webb's pupil and then successor to his practice; a Japanese-style sideboard by E.W. Godwin, an early advocate of Eastern colour and delicacy; Morris glassware designed by T.G. Jackson; a settle by the great G.F. Bodley, painted by Kempe; and a folding bed like a cupboard, carved and painted, from the poet Algernon's Swinburne's house in Putney, bought for six guineas in 1939. Wightwick is the creation of two generations. 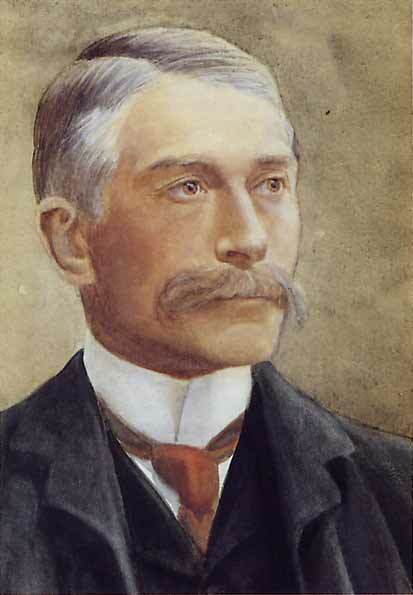 Theodore Mander died in suddenly in 1900, aged 46, while in office as Mayor of Wolverhampton, shortly after having been presented to Queen Victoria. 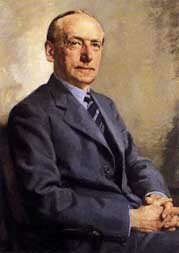 Sir Geoffrey Le Mesurier Mander (1882-1962) was his son and heir, who inherited Wightwick when he was a boy at Harrow, aged just 16. Geoffrey was a radical Liberal member of Parliament and industrialist as chairman of Mander Brothers for a generation, also an art patron. He extended the collections over the coming decades and donated the house to the Nation in 1937. His contributions to Wightwick have outlasted his politics, and were decisive in creating the ensemble we see today; improving and deepening the collections, but also the garden. One of his first acts was in 1910, when, still in his twenties, he was already commissioning Thomas Mawson to design the garden terrace on the south side of the house. The earlier part of the garden had been designed by Alfred Parsons in 1899. Parsons found the garden at that time uninspiring, describing the house to his partner, Charles Tudway, as "a very elaborate modern oak timbered house, the best of its kind that I have seen -- large rambling grounds with no coherence & no leading ideas, & the immediate surrounding of the house about as bad as it could be." But the main impetus was to come after his second marriage in 1930 to Rosalie Glynn Grylls (1905-1988). She was an early female graduate of Oxford; elegant and gifted. Elizabeth Longford, the biographer, was one of the last to remember this exceptional 'Cornish' girl as at Lady Margaret Hall reading Modern Greats, "brown eyed, dark haired, with teeth really like pearls ... who went on from strength to strength". She described her as amusing and amused, full of anecdotes, a vivacious speaker, quick thinking and always exquisitely dressed; she was also "the last of the militant atheists". Her husband, Frank, who took schools on the desk beside her, was taken by "the exceptionally pretty young girl whose arrival was always heralded by a the tap of elegant shoes". Like Geoffrey, Rosalie also entered politics, as a prospective Liberal candidate for Reading, when the Party was enjoying a revival. She became secretary to the Liberal MP, Edgar Granville. But before the time came for her to face the electors, she married Geoffrey in the crypt of the House of Commons. She was eyed with suspicion as a bluestocking in the wider family. She soon became known to Geoffrey's relations, who tended to pious disapproval of divorce and remained wary of radical politics, as 'The Secretary'. 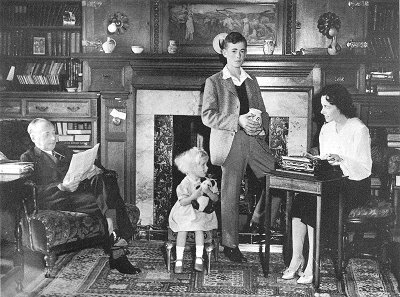 Geoffrey and his family, c. 1948. 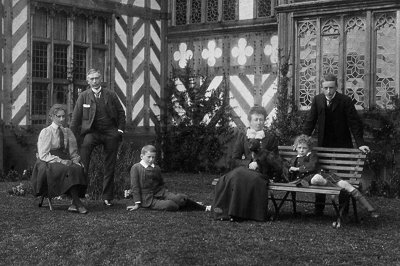 Children Anthea and John are in the centre, and Rosalie his wife, the Victorian biographer, is on the right. Rosalie never lost her interest in progressive politics. But she went on to pursue her literary interests as a highly-regarded biographer and scholar, particularly of the Shelley/Godwin circle and the 'Pre-Raphaeladies'. With her knowledge and encouragement, Geoffrey began in the 1930s to develop and extend the collections at Wightwick and they became pioneers and authorities in the overdue re-assessment of Victorian art.Norman Jewson, architect of Owlpen's revival and redemption, commends Rosalie's book on Rossetti in a letter to Nina Griggs in 1966, "to my mind, a really good and sympathetic biography". They were among the first collectors to take a serious interest in the art and literary manuscripts associated with this late Romantic flowering, coming to know the survivors and successors, the heirs and assigns, of the circle of artists, designers and writers themselves. Many of them now visited Wightwick, like May Morris in 1938, or contributed to the collection, like Helen Rossetti Angeli, daughter of W.M. Rossetti and Lucy Maddox Brown, enriching its associations. wearing a horrible pink knitted dress and grey felt hat covered with stains and dust. She transfixes one like a butterfly on a board. Liked Rosalie and take back disagreeable things I may have said about her pretensions. She is good in her own house, relaxed. [Flat in Buckingham Gate] bright and agreeable. To tea with Lady Mander. A Pre-Raphaelite tea party: Sir Sydney Cockerell with whom I had a long talk about Ruskin whom he knew intimately; Miss Lushington about Rossetti (she has his willow pattern dinner service to sell); Mrs Angeli, William Rossetti's daughter; and Mrs Joseph (Holman Hunt's daughter). It was fun. Though cloistered fast, soar free. 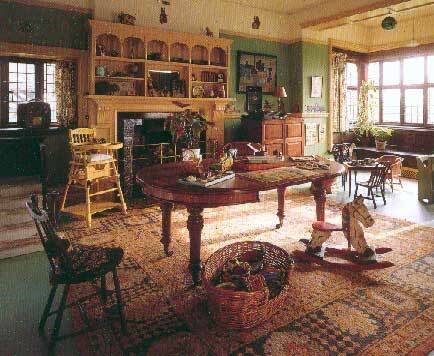 Here, within the fitting context of Arts and Crafts interiors and Ould's architectural setting, of which so much of quality was still in situ, Geoffrey and Rosalie created a many-layered ensemble which was seen as outstanding in its richness and completeness, acting out the associative memory. The Pre-Raphaelite paintings and drawings were a new addition to the house. The three material founder-members (of the seven) of the Brotherhood in 1848 are represented: Dante Gabriel Rossetti, William Holman Hunt and John Everett Millais. Then there is an impressive array of works by artists in their circle: Frederick, Lord Leighton, G.F. Watts (his portraits of Jane, the sister of Thomas Hughes of Tom Brown's Schooldays, and of Effie Gray, who married successively Ruskin and Millais), Ford Maddox Brown (a fine painting of William Michael Rossetti, painted by lamplight in 1856), James Smetham, Walter Crane, Marie Stillman, Elizabeth Siddal, the muse and wife of Dante Gabriel Rossetti (including her self portrait and 'St Agnes Eve') and Ruskin himself, whose support of the Movement through the Fifties helped to establish their reputations. There is the celebrated portrait of Janey Morris, begun by Rossetti, but completed by Maddox Brown. Morris was never among the Pre-Raphaelites, of course (although he had an early ambition to become a painter), but his designs are displayed, as he intended, alongside Jacobean and early eighteenth-century furniture, Chinese porcelain, Flemish verdure tapestries, Persian rugs, again suggesting an organic process of accumulation and aggregation. 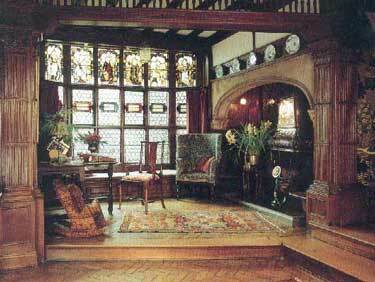 At Wightwick, Morris's decoration is not seen as an eccentric or precious reaction to Victorian commercial design, but itself a commercial project responding to, part of, a widespread eclectic attitude to the past, shored up by a mosaic of objects, memories and reciprocal influences. Wightwick came to epitomise what C.L. Eastlake described as "the picturesque element which has become conspicuous in the appointment of many English homes [which] may be traced to the early efforts of William Morris and Burne-Jones". It was recognised that, apart from the Green Dining Room at the V.&A., few of the larger-scale Morris & Co. interior schemes for the Ionides, Bell, Wyndham, Howard and d'Arcy families, even St James's Palace itself, had survived. In December 1937 the future of house and collection was finally secured when Geoffrey presented it to the National Trust, with an endowment of 20,000 Manders shares. He was encouraged by the Trevelyans (of another Liberal family, who gave Wallington shortly afterwards) and Professor W.G. Constable, of the Courtauld Institute. But it was a courageous acquisition at a time when Victorian art and architecture in all their forms were little esteemed. This was the first country house to be presented during the lifetime of its donor and arguably the first presented under the Country Houses Scheme itself. Rosalie Mander wrote: "He never regretted it, for he liked to think that the public should enjoy what had been his private property." He delighted in showing visitors round the house, and insisted on keeping no quarters barred from public view. Geoffrey and Rosalie continued to add to the collections, in association with the Trust buying good examples of Pre-Raphaelite art and William Morris furnishings in the period when they were least popular in the '50s and '60s. Their vision was prophetic; they were ahead of their time in their recognition of the importance of the house and its collections. The house has since acquired more by loan, gift and bequest: early Rossetti drawings on loan from Mrs Katherine Macdonald, a walnut rosewood piano made by Hopkinson for the Crystal Palace Exhibition of 1851. 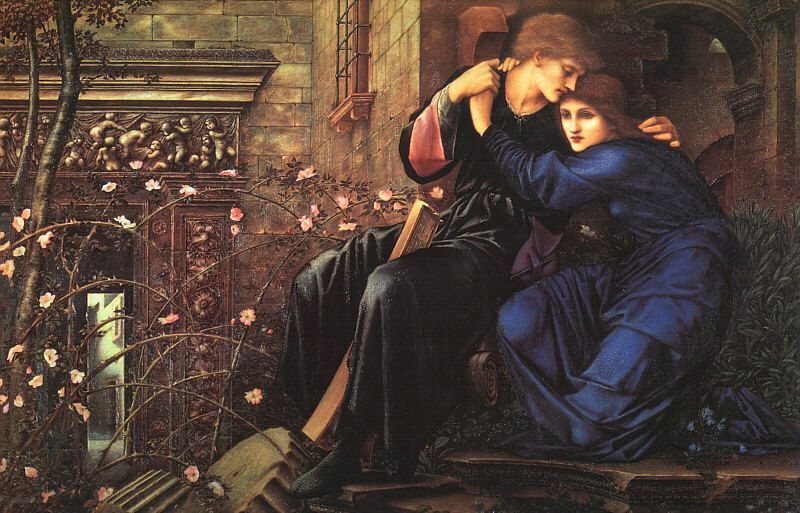 Set prominently at the end of the Great Parlour is Edward Burne-Jones's Love Among the Ruins (1894), a late version of one his most evocative works from the Samuel collection at Upton House (National Trust). Robert Browning's poem of the same title, with its transient narrative of young lovers meeting to extinguish sight and speech "each on each" in the last turret of a city once great and gay, now overspread with the briar rose, dramatises a powerful moral: "Love is Best". Here Gerard Manley Hopkins noted a stranger "instress of expression", referring to the neo-Platonic Hypnerotomachia, a dream world of neurosis, of mental strife in the pursuit of love. The lover sits with his Polia among the broken pillars and enigmatic inscriptions of the temple of a bygone age, both unsated on their journey to Cytherea, where they will find not fulfilment, but separation. Its classical architectural capriccio could be taken as a symbol of Wightwick and of Ruskin's romantic-associationist aesthetics which posited architecture as embodied memory, which rises out of the "contrast of the beautiful past with the ... monotonous present [and] depends on the existence of ruins and traditions, on the remains of architecture, the precursorship of eventful history". Under Geoffrey and Rosalie's guardianship, Wightwick was both a living house in renewal with a growing collection, but also a remarkably intact survivor of the previous generation, and a richly nuanced expression of Victorian liberal culture. It is appropriate that they fostered links with the romantic Utopian socialism preached by Morris, and many of the radical politicians and thinkers of the day visited. Geoffrey had installed a squash court at Wightwick in 1928 and continued to play tennis there until just shortly before he died aged eighty in 1962. But his widow, Rosalie, was much younger, and presided for another quarter of a century as a welcoming if capricious chatelaine, continuing to write and to lecture until her death in 1988. Since then, much has been discovered about the house in its re-ordered archives, and there has been increasing interest in the life of the back rooms: the tiled kitchen with its range made by the Eagle Range and Gas Company of Birmingham; the servants' garrets which, exceptionally for the time, had central heating; and the cloakroom and Turkish bath (the only other known is at Cragside). Muthesius suggests that in such rooms we experience the first stirrings of functional Modernism. possibly one of the nicest rooms in Britain -- light and happy, with distempered green walls, yellowy cream woodwork and green linoleum. 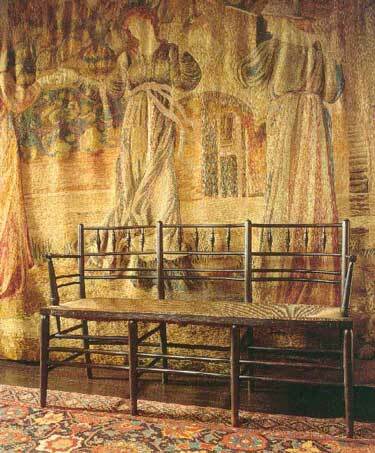 The curtain materials depict 'The House that Jack Built' and 'Alice in Wonderland' and are designed by Voysey. The smell of hot buttered toast is almost in the air. The most complete example of late nineteenth-century artistic taste ... one of the two or three places in the world you must visit if you are interested in William Morris and the Arts and Crafts movement. 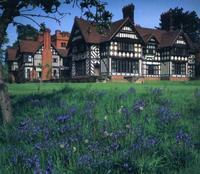 Candida Lycett Green sums Wightwick up as "in its way, one of the wonders of the world". See obituaries in The Times (4 Nov. 1988); The Daily Telegraph (in part by Elizabeth Longford, 4 Nov. 1988); and Martin Drury (National Trust Magazine, Summer 1989). Director of the Courtauld Institute, London, and Slade Professor of Fine Art at Cambridge. Another kindred spirit in the League of Nations, connected (distantly) by marriage through the Turnbull family, was Roger, ninth Lord Stamford; the tenth earl presented Dunham Massey to the National Trust in 1976. He calls for a new aesthetic based on "spiritualized practical intention". "There are signs of this in those parts of the house that have to do with hygene" (The English House, 1904-5, trans. J. Seligman, 1979, p. 163). The cabinet designed by Webb in 1861, now in the V.&A., was at Compton House. It has a front painted by Morris with scenes from the legend of St. George.